Home / Adviart Blog / Podcasts ARE FUN. Podcasts ARE FUN. This adviarter picked a shell and decided to use a statement to display his advice. There is a mix of lowercase and uppercase letter letters in addition to a smiley face. The blue was used because this is the adviarter’s favorite color. The conversation on this shell revolved around perspective of the ROI of listening to a podcast. 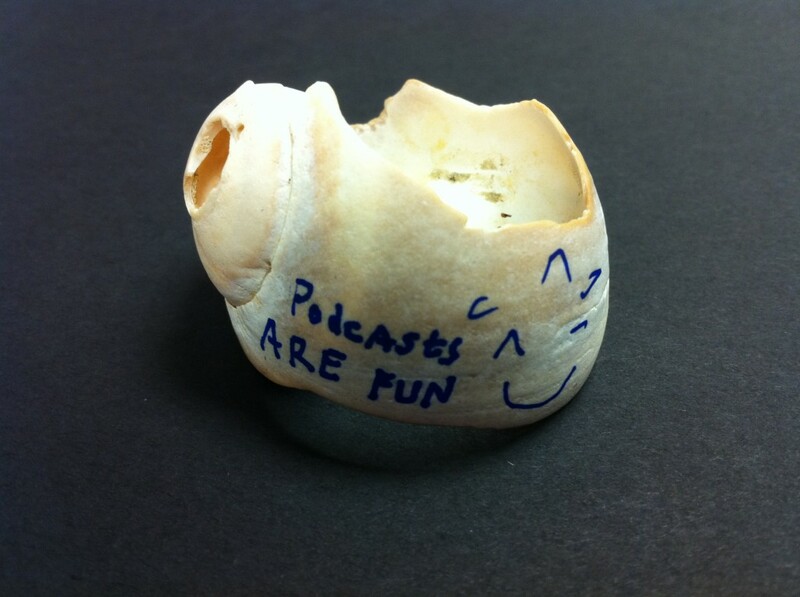 While the adviarter and I differ on many viewpoints, you certainly can’t knock the passion behind the shell in highlighting the benefit of listening to a podcast. The conversation around this shell included references to certain popular books. Podcasts are fun–I agree (if they are done well and aligned with a person’s interests). However, what this adviart made me think more closely about was the perspective of how someone learns when engaging with a podcast. If a person doesn’t learn in an auditory fashion, podcasts are really difficult to pitch as a learning method. However, I’m positive there are other ways to consider pitching the value of podcasts to a non-audio learner. The question is, how do you do that? How do you pitch? What is required in understanding of the other group’s perspective?